alaTest has collected and analyzed 221 reviews of Sony BRAVIA KD-55A1. The average rating for this product is 4.8/5, compared to an average rating of 4.3/5 for other products in the same category for all reviews. Opinions about the durability and usability are generally positive. The image quality and sound are also appreciated, but reviews are divided on the price. We analyzed user and expert ratings, product age and more factors. Compared to other products in the same category the Sony BRAVIA KD-55A1 is awarded an overall alaScore™ of 95/100 = Excellent quality. 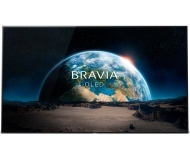 Veredelt: Die Fernbedienung des Bravia-OLEDs wirkt dank der Rückseite aus Metall hochwertig. Das Tastenfeld könnte jedoch aufgeräumter sein; besonders im Bereich des Cursor-Elements in der Mitte.